Mary Magdalen was the first recorded witness to the resurrection of Jesus, His most ardent and loving follower. She had stood with His mother Mary at the foot of the cross on that brutal Good Friday afternoon and had been by the side of Mary during those difficult hours. On Easter morning, she went with the other women to the tomb and it was there, in the garden near the tomb, that Jesus appeared to her. It was she who brought the news of the resurrection to the apostles, causing Peter and John to race to the tomb to see what had happened. She was from Magdala, a small fishing town on the Sea of Galilee, between Capernaum and Tiberias. She was known to be a "great sinner", a woman of the streets who heard Jesus speak of the mercy and forgiveness of God and subsequently changed her life completely. This tradition explains why Mary Magdalene was revered for centuries as the "model penitent". Her matter-of-fact witness to the resurrection moved Peter and John to go and see for themselves: "I have seen the Lord and these things he said to me". Jesus had chosen her to bring the news to them and she simply told them what had happened. She has always been an example of great love and great forgiveness, one of those close to Jesus who grasped the truth of God's love for human beings and spent her life bearing witness to that love. St Mary Magdalen is the first Ipswich church that many visitors see, standing as it does on Norwich Road, the main way into town from the midlands and the north. Set back from the road, it has the presbytery beside it, a Madonna on its wall surrounded by roses. It opened in 1956, to serve the rapidly expanding population of this area. Carved out of St Pancras parish, it retains the St Pancras Catholic primary school under its wing. This is a wide, mixed parish, from the pleasant well-to-do villages west of Ipswich, to challenging and deprived Whitton, Suffolk's poorest housing estate. Despite the grandly herring-boned west end, it is the least architecturally significant of the five Catholic churches in Ipswich. But what it does have is a superb east end, with the finest coloured glass of any of them. In vivid reds, interspersed with contrasting panes, it represents the Sanctus of the Mass. A simple, beautiful crucifix hangs beneath. 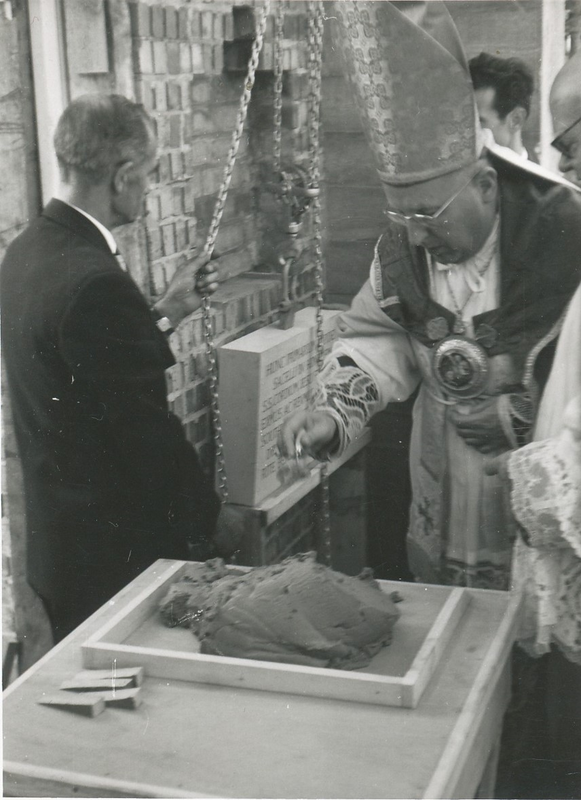 Nearby, the foundation stone of the church records grandly in Latin that Leo, Bishop of Northampton, laid this stone to mark the beginning of the raising of the church dedicated to St Mary of Magdala on the 29th October 1955, when Pius XII was Pope. Latin does not ring around its walls as much as it did then, but this church remains a simple and beautiful place. St Mary Magdalens church, 2014. A pen and ink sketch by Elliott Garbett. 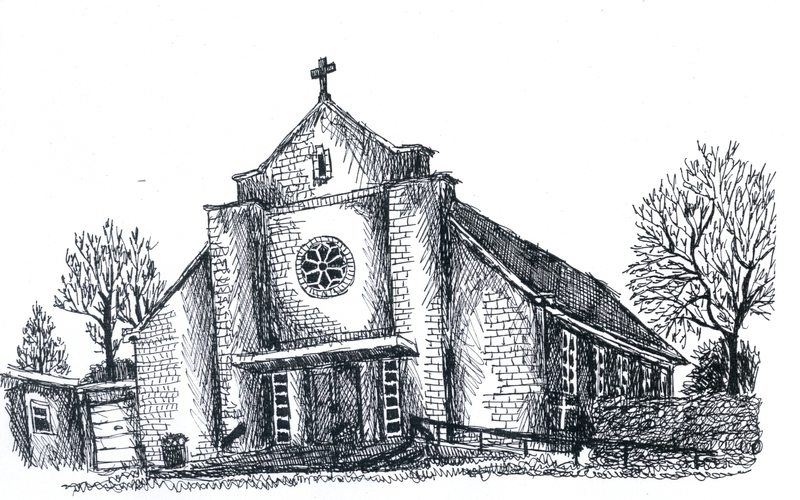 Since the founding of the parish in 1954, St Mary Magdalens has been served by 9 parish priests. These are shown below in chronological order. Pauline Richardson, who lived with her parents in the parish and attended the Convent School of Jesus and Mary in Woodbridge Road, became a nun in the order of Jesus and Mary on leaving school in the mid 1950s. She served with her order in Bolivia and more recently in Syria. 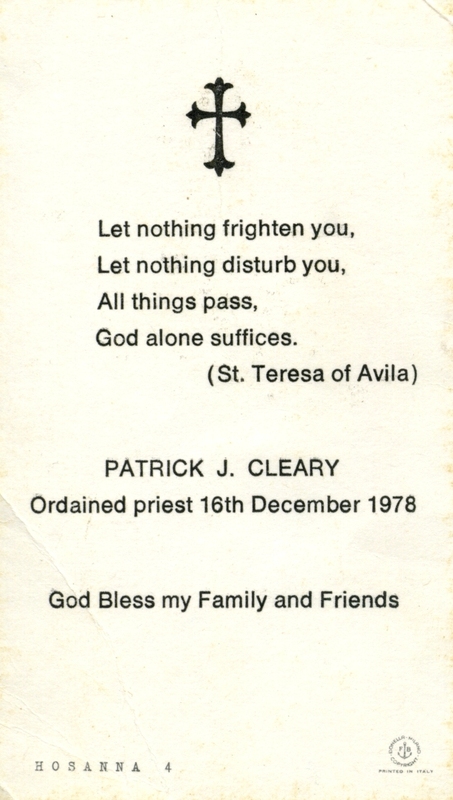 On 16th December, 1978, Fr Patrick Cleary, son of one of the founding families of the parish, was ordained priest by Bishop Alan Clark at St Johnâ€™s cathedral in Norwich. 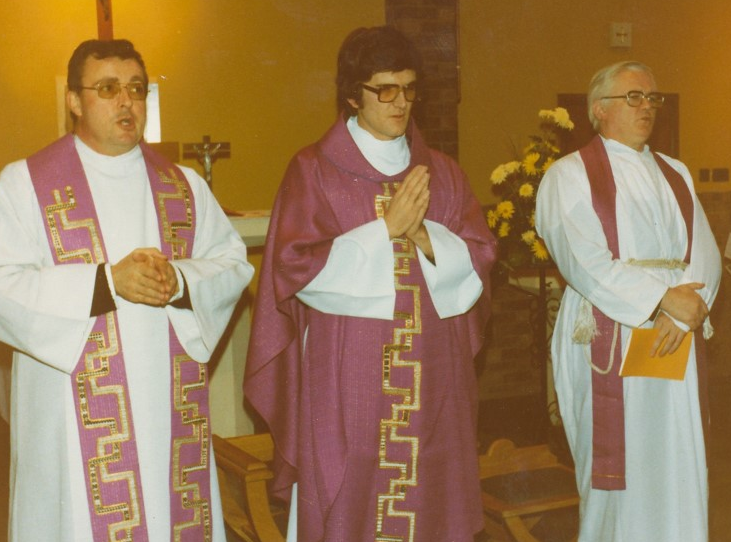 Fr Patrick Cleary on the occasion of his first Mass at St Mary Magdalens 17th December 1978, on the day after his ordination. To his right is Fr Sketch, parish priest and to his left is Fr Lane from the seminary where Fr Pat trained. 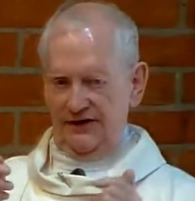 Iain Mathew, son of a prominent Ipswich catholic family who regularly attended St Mary Magdalens, became a Carmelite and was ordained priest July 2nd, 1986 at the Carmelite church in Gerrards Cross. 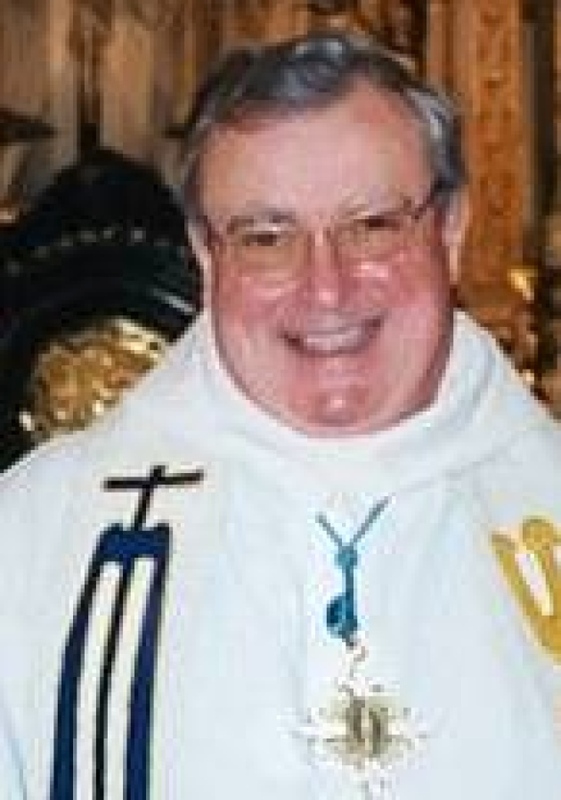 Fr Michael Collis, a parishioner of St Mary Magdalen parish, was ordained priest for the Diocese of East Anglia by Bishop Michael Evans, July 10th 2010. More recently, Paul Nelson, a parishioner of St Mary Magdalens, became a religious brother. 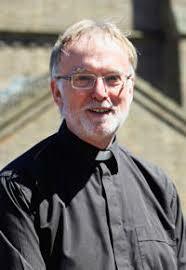 He is now Brother Dunstan OSB in the Benedictine community at Belmont Abbey, Herefordshire, having taken his vows Sunday February 2nd 2014. 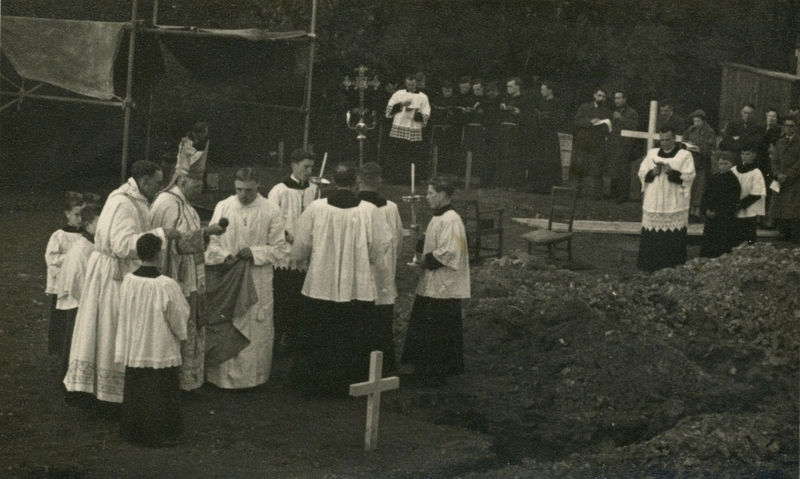 Before the parish of St Mary Magdalen was founded, Mass was said in the north west of Ipswich at various venues, in an attempt to gauge the Catholic support in this growing part of town. 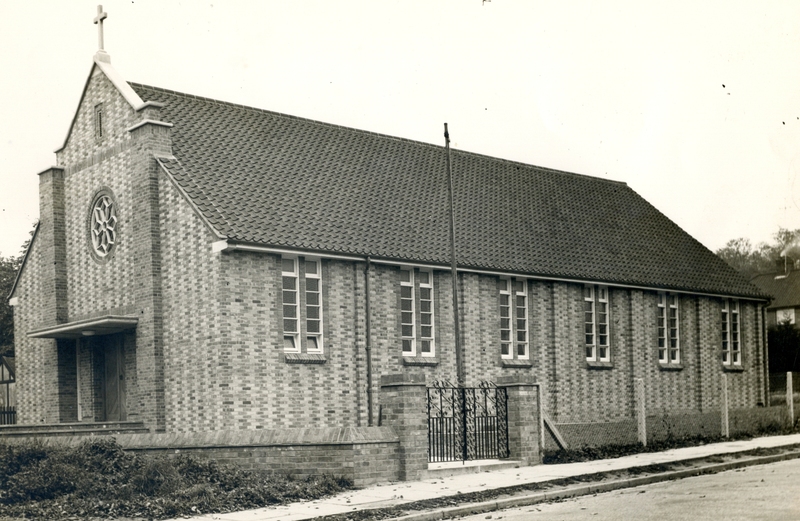 Support was such that Mass was then regularly celebrated in a variety of places - "the upper room" at the Suffolk Punch public house on Norwich Road was one such venue, others being the Castle Hill Community Centre and the Safe Harbour public house in Meredith Road. 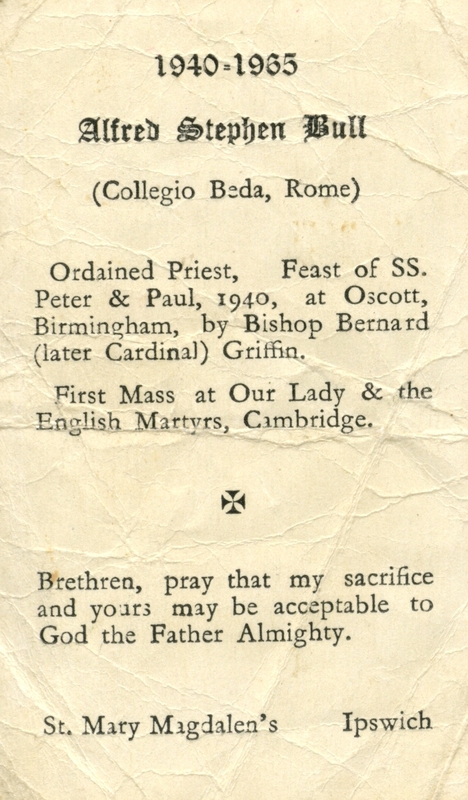 Masses were celebrated by Canon Augustine Peacock, parish priest of the parent St Pancras parish in Ipswich town centre, or one of his curates. 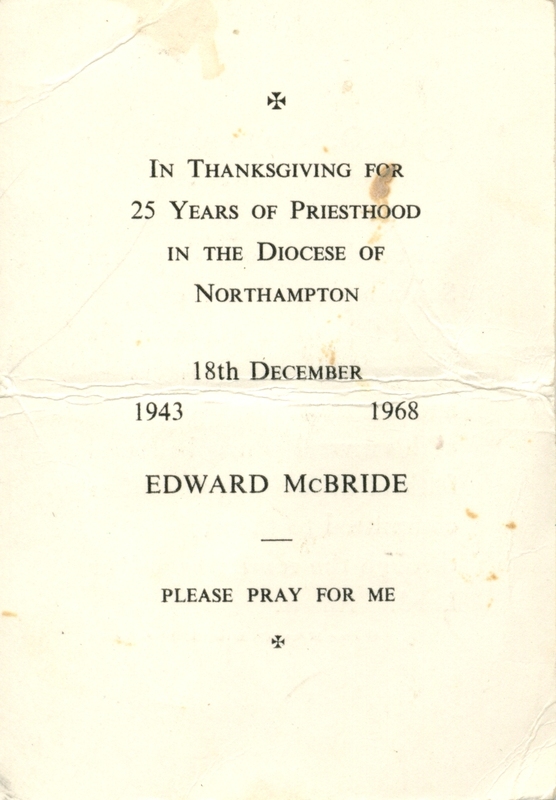 The presbytery at 468 Norwich Road, was acquired by the diocese on 6th October 1954. This property had a large side extension and this became known as the "Guild Room", initially being used as a chapel where Mass was celebrated daily during the week and on Sundays at 8:00. A second Sunday Mass was celebrated in the Safe Harbour at 10:30. 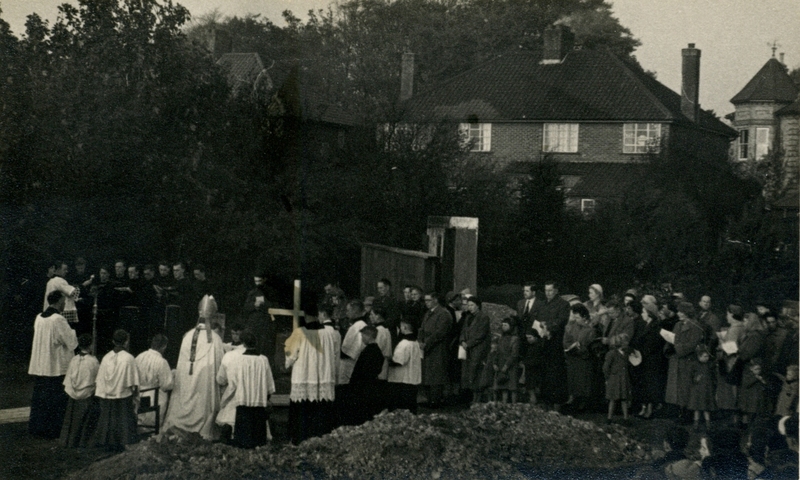 In 1955, the corner plot of land adjacent to the presbytery on Highfield Approach, was acquired and work started to build a permanent new church on that site. 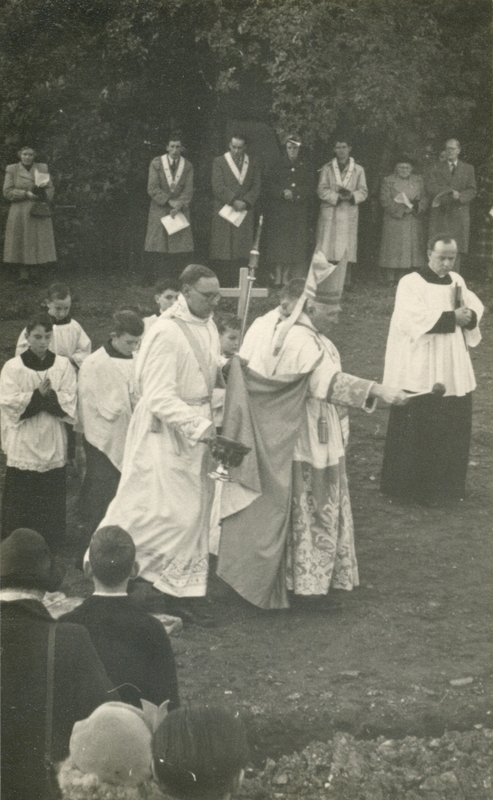 On October 29th, 1955, Bishop of Northampton, Leo Parker, laid the foundation stone of the new building and returned on June 1st 1956 to solemnly bless the completed church. Sadly, Canon Peacock who had played a major role in the founding the new parish of St Mary Magdalen, passed away on 7th May 1956 and never saw the completed parish church. 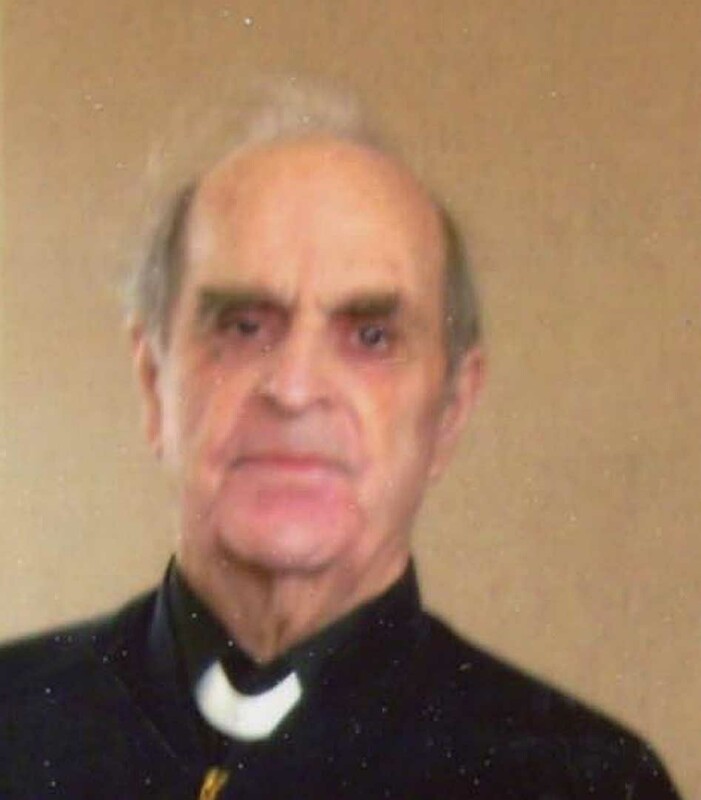 The first parish priest was Fr Gerard Conlon, a devoted man who worked tirelessly to establish the parish and build up the groups and organisations necessary for a thriving parish. A dedicated group of parishioners worked tirelessly at evenings and weekends to finish the church grounds, laying concrete, planting hedges and trees and decorating to help reduce the overall construction costs. St Pancras primary school moved from the old hall in St Pancras church to a newly built property in Stratford Road, and was taken under the wing of the new St Mary Magdalen parish. The new school buildings, consisting of three classrooms, were blessed by Bishop Parker on March 21st, 1958. On October 12th 1961, two more classrooms and a new school hall were officially opened and blessed. 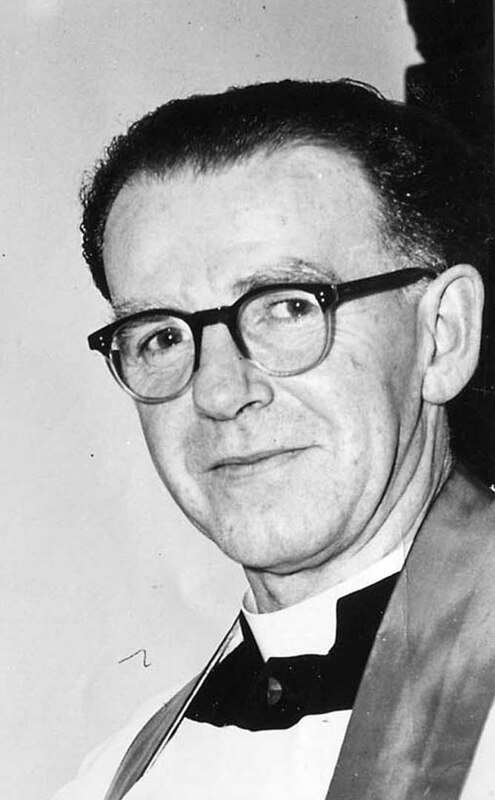 The next challenge for Fr Conlon was the building of a church hall. Land was acquired on Highfield Approach, on the opposite side of the road to the church, and the hall and car park were built on this site. 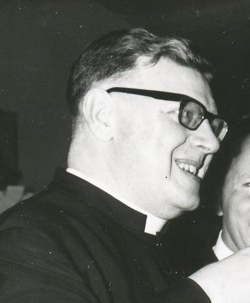 The hall was officially opened in March 1963 and blessed by Bishop Parker, but this joyous occasion of the hall's opening was saddened when Bishop Parker took the opportunity to announce to the parish that Fr Conlon was to be moved to St Josephs, Luton. 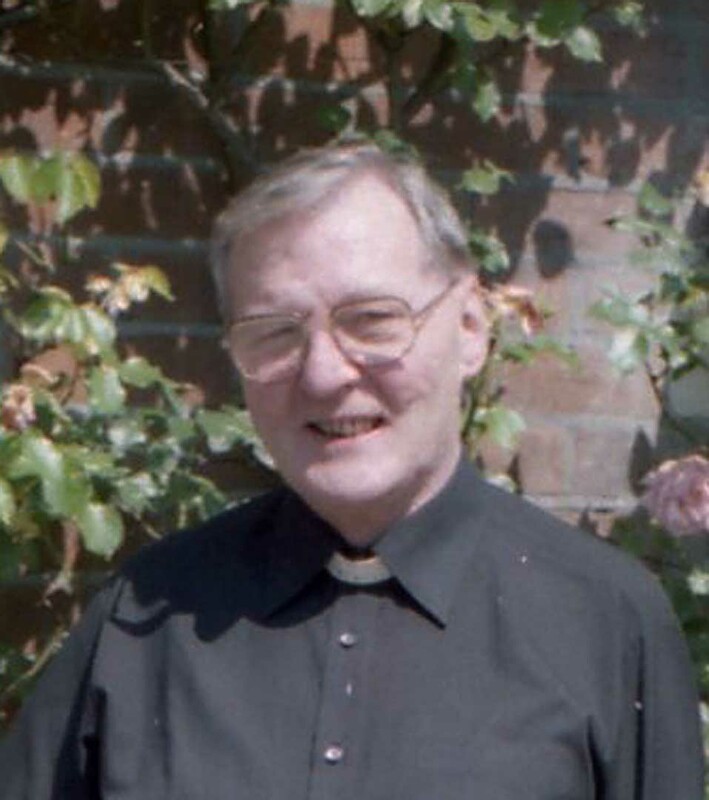 Sadly, Fr Conlon passed away suddenly and unexpectedly on 12th December 1966. Apart from a thriving parish, another legacy attributable to him is the statue of Our Lady of Lourdes, mounted on the outside wall of the presbytery and visible to all passing by on Norwich Road. This statue was erected in memory of Fr Conlon's mother who passed away on the feast of Our Lady of Lourdes, 11th February 1960. The statue is surrounded by a climbing rose which routinely produces magnificent flowers in spring and summer. The adjacent pictures show early views of the newly opened church, interior and exterior views. 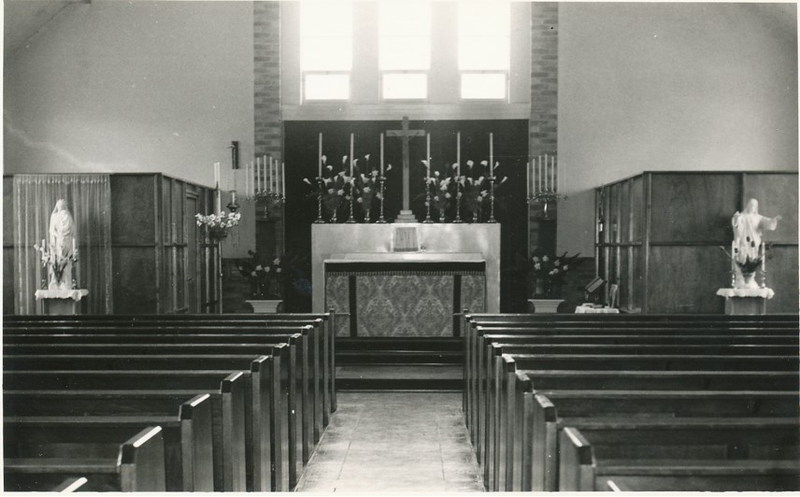 The exact dates of these photographs is unknown but they would both have been taken in the late 1950s shortly after the church was completed. With grateful thanks to N C Andrews, T M and J F Cleary for content and photographs. The church is wheel chair accessible and is equipped with an induction loop system for the benefit of hearing aid users. Male and female toilets are available in the Guild Room adjacent to the church, with baby change facilities, for use by both mums and dads, available in the female toilet. There is not an accessible toilet. The church is served by Ipswich Buses routes 9 and 10 with stops adjacent to the corner of Highfield Approach. The church hall and car park is on the opposite side of Highfield Approach. Parishioners and visitors are encouraged to use the car park rather than park on Highfield Approach, which gets congested and where parked vehicles restrict access to neighbouring properties. The hall is available for private hire by people looking for a regular booking (subject to availability). If you are interested in hiring the hall, please use the contact form to get in touch with the hall booking secretary. Following the Second Vatican Council, Vatican II, which concluded December 8th 1965, a number of major changes were made to the liturgy and administrative practices with the intention of making the Church more efficient and more acceptable to the 20th century world. Most obvious were changes in the mass, which had previously been said in Latin, with the priest facing away from the congregation, often praying silently. After the Council, the feel of the mass changed drastically. It was now to be conducted in the language of the people and participation was encouraged in new ways, with new possibilities granted for music and singing, and women allowed into upfront roles as readers and Eucharistic ministers, as well as altar servers in some places. 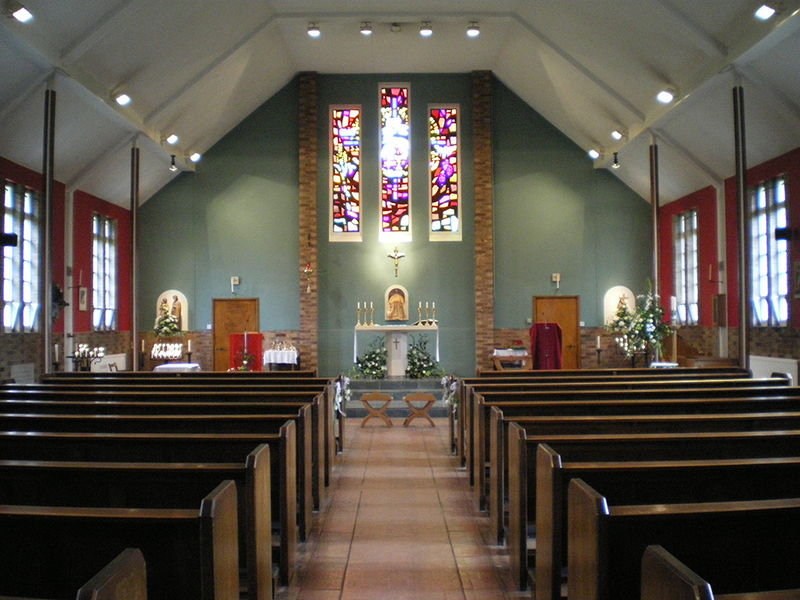 At the same time, the church was re-decorated in the papal colours, new robes were ordered for the altar servers and matching sacred vessels, crucifix, tabernacle, candle holders, processional cross, thurible, paschal candle stand, cruets, presidential chair and servers chairs were obtained - paid for by parish subscriptions. A second-hand pipe organ was acquired from Hadleigh church and installed into the new gallery. The result was a very attractive church interior suitably updated to reflect the changes instigated through Vatican II. Following the re-modelling, the church was consecrated on the feast of St Mary Magdalen, 22nd July 1979. Through a collaboration with our friends at the Hollesley Bay Colony, the original church pews which were very dark in colour, were stripped to bare wood and refurbished in 2016 and finished in a lighter colour. Also in 2016, a new sound system was installed. In 2017, a new electronic organ was installed, funded as the parish project through the Diocesan Alive in Faith initiative, and the old pipe organ was re-homed to a church in Poland. The gallery, built as part of the 1978 conversion, was revised in 2018 with the curtain wall being lowered to improve visibility of the altar from the gallery and new wrought iron balustrade installed. 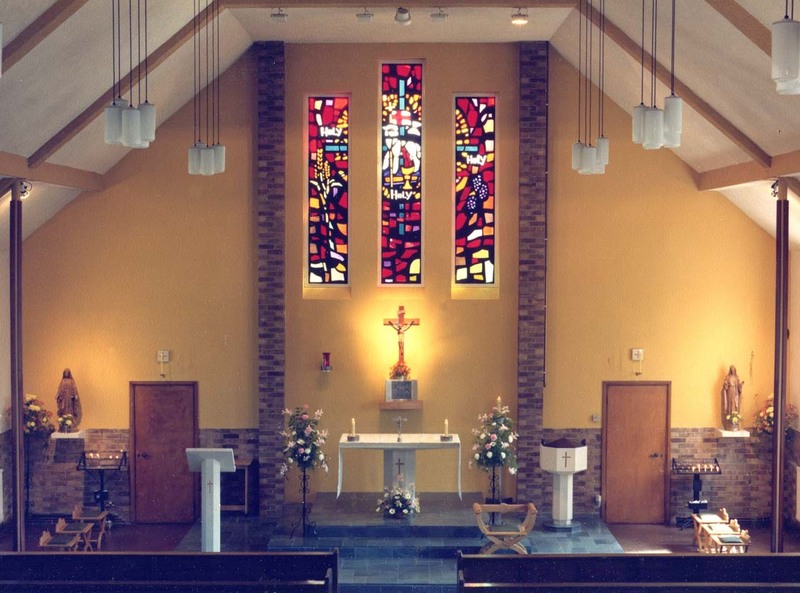 In 2019, the church lighting was upgraded to new LED fittings to reduce running costs and eliminate high level work required to replace lamps in the old units. Copyright 2019 St. Mary Magdalen.